HOW TO VIEW THE ECLIPSE SAFELY» The only time you can safely look at an eclipse with unprotected eyes if you are standing within the path of totality while the moon is fully covering the sun. If the sun is partially eclipsed, it’s just as dangerous to your eyes as it is normally. Sunglasses and unfiltered cameras, telescopes and binoculars won’t cut it.“Even when it’s 95 percent covered, it’s still not safe to look at because the sun is just that bright,” UNC assistant professor of astronomy Charles Kuehn said.» The easiest way for most people to safely view the eclipse is through eclipse glasses, which look like 3-D movie glasses and you can buy online. Make sure they’re certified ISO 12312-2 — it will say so on the glasses — as according to NASA that is the international standard for solar viewing.» Welders can watch the eclipse through their hoods if they have a No. 14 filter or darker.» You can build a pinhole camera — which lets you look at the eclipse indirectly — or install a solar filter on your telescope. Most telescope manufacturers should sell solar filters.» Have some common sense. 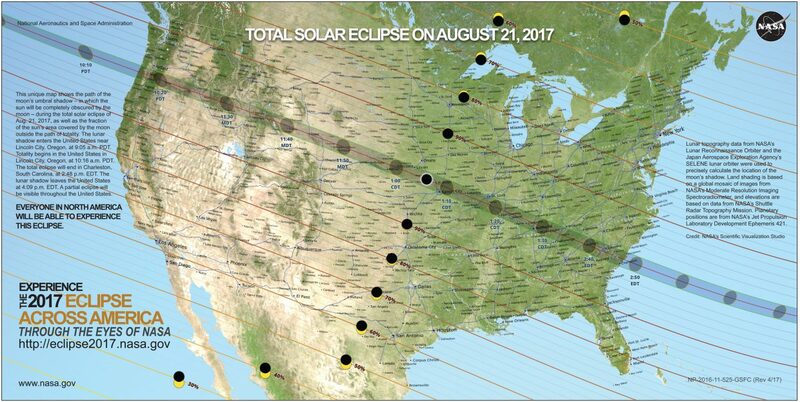 You wouldn’t stare at the sun with unprotected eyes any other time, so don’t do it on Aug. 21.WATCHING THE ECLIPSE FROM 13,804 FEET HIGH IN THE MOUNTAINSFor only the most dedicated, the eclipse’s path of totality will pass over Gannett Peak, the highest mountain in Wyoming, the highest in the Rocky Mountains outside of Colorado and the highest point within the path of totality.Gannett is a four-hour drive from Craig — take Colo. 13 North from Craig, go west on Interstate 80, then at Rock Springs exit onto Highway 191 and take it north to Pinedale, then start hoofing it on the Pole Creek Trail — and its remoteness means you should encounter less of the masses that will gather elsewhere in Wyoming.But that isolation also works against you. Outside of Denali in Alaska and Mount Tacoma (Rainier) in Washington, Gannett is considered the hardest state high point to reach. The standard route is 40 miles round-trip with more than 9,000 feet of elevation gain and involves traversing a glacier, among other steep snow and ice climbing, and Class 3 scrambling.It takes most people three to five days to summit and descend. Crampons, an ice axe and rope are a must. But if you want your eclipse viewing to come with a side of an unparalleled mountaineering experience, start on Aug. 19 or 20 and summit before 10:30 a.m. on the 21st.